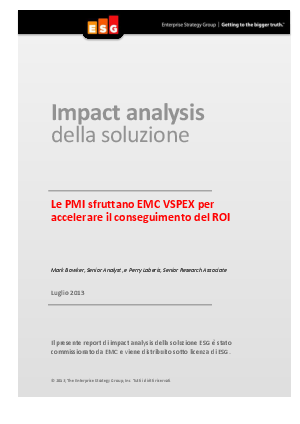 EMC VSPEX provides a flexible, integrated computing platform (ICP) that reduces capital expenditure (CAPEX) and leads to a positive return on investment (ROI). Solution flexibility, enabling reduced CAPEX and infrastructure familiarity. Quicker time-to-market, leading to faster ROI. Improved system performance through hardware compatibility. Simplified support model with fewer points of contact. Reduced hardware footprint through decommissioned legacy equipment. Less required maintenance, enabling reallocation of time for IT innovation.